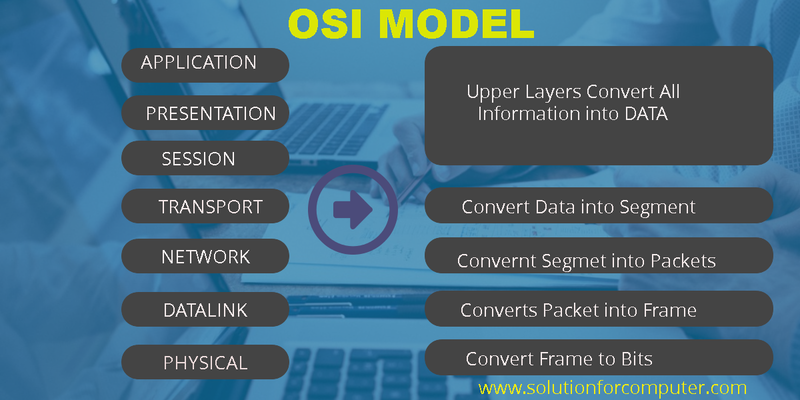 What is OSI Model / OSI Layers. 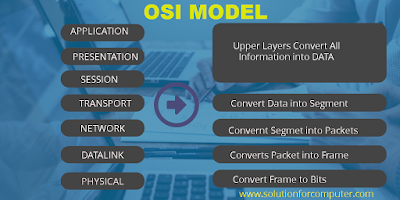 Introduction :- OSI/ Open System Interface - The OSI reference model describes how information from a software application in one computers moves through a network medium to a software application in another computer. This OSI Model was developed by the INTERNATIONAL ORIGINATION for STANDARDIZATION (ISO) in 1994, and it is now considered the primary architectural model for inter-computer communication . A task or group of task is then assigned to each of the seven OSI layers.Each Layers is reasonable self contained, so that task assign to each layer can be implemented independently. 2. Data Link Layer :- The data link layer provides the functional and procedural means to transfer data between network entities to detect and possibly correct error and many occur in the Physical Layer. 3. Network Layer :- The Network Layers Provides the functional and procedural means of transferring variable length data sequences from a source to destination via one or more network while maintaining the quality of server, requested by the transport layer. The network layer performs network routing fund-ions, and might also perform fragmentation and reassembly , and delivery errors. Routers operate at the layer sending data through the extended network and making the internet possible. 4 Transport Layer :- The Transport Layer provides transparent transfer of data between end-user, provide-sing reliable data transfer service to upper layer. The transfer layer control the reliability of a given link through flow control, segmentation / desegregation , and error control. some protocol are state and connection oriented. This means that transport can keep track of the segment and re transmit those that fail. 5. Session Layer :- The session layer control the connection between computer . It establishes, manage and terminates the connection between the local and remote application. It provides for full duplex , half-duplex and restart procedures. 6. Presentation Layer :- The Presentation Layer entities can use different syntax and semantic as long as the presentation service understand both and the mapping between them.The presentation service data units are then encapsulated into session protocol data units and moved down the stack. 7. Application Layer :- The application layer interface directly to end process common application service for the application process . It also issues requests to the presentation layer. Note carefully that this layer provides service to user define application process and not to the end user. 1. Physical :- NIC, Twisted Pair , Fiber Optical , Wireless media, Repeater, Hubs , etc. 2. Data Link :- Ethernet, Token ring , LAN , Wi/Fi, Router etc. 4. Transport :- TCP , UDP, RTP, ATP. wow great information thanks for that you doing good work. keep it up.